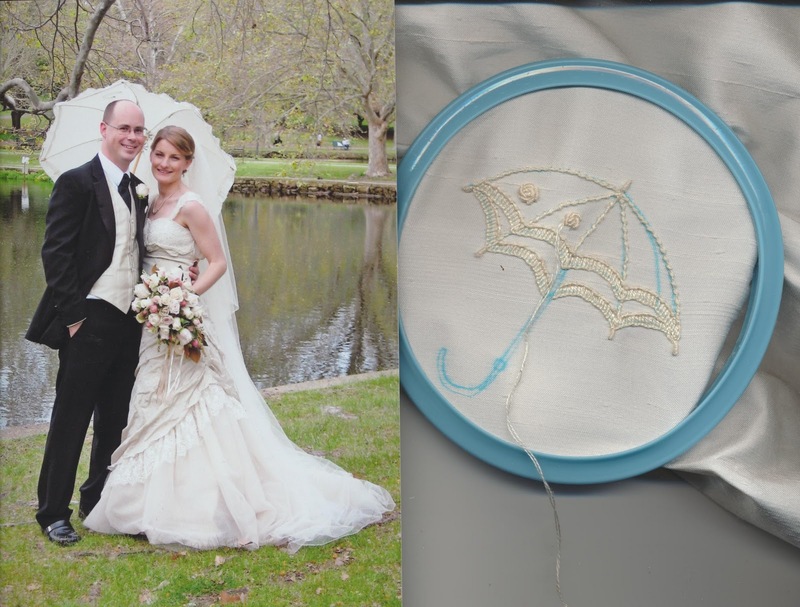 I spent a lovely afternoon stitching a parasol for my next Block 12 while watching the entire three hours of DVD from my nephew's wedding. Last September when Russell married Amanda, we were overseas in the UK and couldn't go which was a huge disappointment but our trip was booked before their wedding was!! Anyway today was another hot day 38 degrees celsius again so I sat under the air-conditioner and sewed on my hand-drawn parasol and watched Russell and Amanda tie the knot, I even cried when Amanda walked down the aisle of our childhood church just like I would have if I had been there. Weddings do that to me, especially when the young people are as totally in love as this couple is - it truly is a match made in Heaven. Congratulations all over again, you two!!!! It wasn't until I blogged the photo that I realised that my inspiration for a parasol was right there in front of me...duh!! !